Let’s fight to see true intelligence once again reign in the hearts and minds of men. Christianity comes in two distinct packages. There is the sort of Christian who fits in with society, never offends anyone, and remains quiet in those moments when speaking up would be tantamount to reputational suicide. Then there is the other sort—the dunce-ish, doofish, dodo-ish, dumbellish, dum-dumish, doltish sort of Christian, who, even if they tried, can’t seem to ever fit in. This second kind of Christian exudes the fragrance of heaven and offends people who prefer the aroma of worldly things. They just can’t remain silent, even though being “fools for Christ” may cost them their very lives. The first sort of Christian is common in this earth. The second is quite rare. The first is powerless to change the world for Christ. The second is the chosen tool of Jesus Christ to alter the course of history. Our goal to raise up the second sort of Christian—men and women fearless to stand upon the timeless Word of God and lovingly and courageously live it out in their lives. It is our great passion to equip believers to be bold confessors, willing to joyfully bear the stigma of Christ, be deemed the fool, and share in the fellowship of His sufferings, in order that the Lamb that was slain may, in fact, receive the reward of His sufferings. Christian, there is a dunce cap with your name on it. 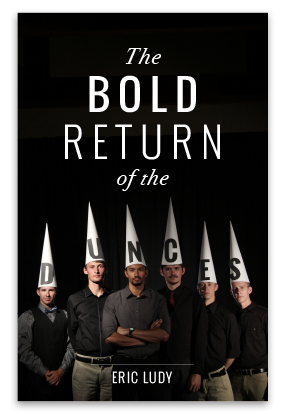 Would you be so kind as to be a true Christian and boldly stick it on your head?—for it’s high time for the dunces, doofs, dodos, dumbbells, dumdums, and dolts for Jesus Christ to return to the stage of time.